Need Dana Point bee removal? Bees love the abundant nature found in Dana Point. Hence, keep your family safe from unwanted bee swarms and hives by calling The Bee Man for any Dana Point bee removal needs you may have. 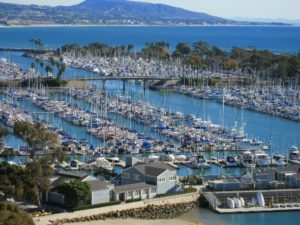 Dana Point is certainly a destination location for many visitors. Certainly, the beautiful harbor, Doheny State Beach, Salt Creek State Park and the Ocean Institute, provide families many reasons to enjoy the outdoors. Furthermore, Dana Point has an average of 275 sunny days and an average high temperature of 79 in July, making it a great place to enjoy. As a result, unfortunately, bees also find these conditions great for thriving. Bees go through a complicated infestation cycle that begins with the birth of a new queen bee. Because hives can only have one queen, the old queen is kicked out along with half of the colony. This group of bees is known as a swarm. These swarms fly off looking for a new place to build a hive. For the next three days, scout bees will look for a new hive location. Once found, the colony will go to that location and begin building the hive. No matter where bees are in the infestation cycle (click here for more details), The Bee Man is available for Dana Point bee removal of any nature. It is important to note that if you see a swarm of bees (a clump resting in a specific area), there is a good chance they will all fly away within 1-3 days. They are simply waiting for scout bees to find a new location for a hive. If they are still there for more than 3 days, then you may have a potential problem. Therefore, call The Bee Man to remove the bees before any property damage occurs. If you need Dana Point bee removal, please call The Bee Man at (949) 455-0123.